A Japanese businessman who was publicly accused this week of defrauding nearly 100 compatriots out of millions of dollars in fake Cambodian real estate deals an­nounced Friday the launch of a new technology project in Banteay Meanchey province. 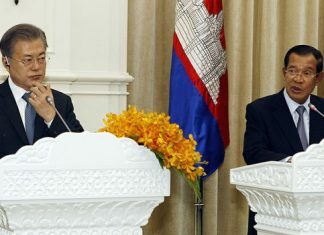 Ikuo Konno, who says he is an adviser to Deputy Prime Minister Ke Kim Yan, said at a press conference that a joint venture between Tokyo-based Taitech Solutions and his AAP International Cambodia would begin to produce touch screens for mobile phones next year. “We are planning to invest $4 million to construct a factory in Cam­bodia’s Banteay Meanchey province to produce cell phone screens because I think that the labor cost here is low compared to other countries like China and Vietnam,” Mr. Kakada said. At the press conference in Phnom Penh Tower, Mr. Konno, who also goes by the name Konno Kakada, said that AAP, of which he is the CEO, would invest 51 percent of the capital, with Taitech Solutions to cover the rest. 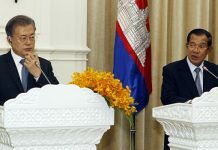 The joint venture chose to place its new factory on the two-hectare plot in Banteay Meanchey, Mr. Konno said, due to the low cost of Cambodian labor and political unrest in other countries in the region. 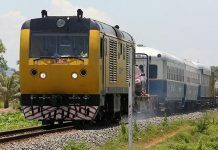 “We are interested in investing in Cambodia also because Thailand is facing political unrest and Vietnam and China are having tensions with each other,” he said, adding that the company would offer monthly wages of $160 to 200 staff when operations begin in late 2015. On Thursday, a team of lawyers from Japan held a press conference at which they called for the arrest of Mr. Konno, claiming that investigations in Japan found him to be the ringleader of a scam that cheated 99 people, most of them elderly, by selling real estate that did not exist. The plaintiffs claim damages of $20.1 million. In response, Mr. Konno, who resides in Cambodia, filed for defamation against the team of lawyers, claiming that the land and apartments do exist. At the same time, Mr. Konno said that he could not be guilty of such crimes because he held numerous official posts with the government, including adviser to the National Authority for Combating Drugs and technical adviser to the National Police Academy. Despite his current legal battles, at the press conference Friday he said he had no doubts that his new project would go ahead. “We have no worry about this project because we are highly committed to implement it until we succeed,” he said. Oung Oeun, the recently replaced governor of Banteay Meanchey province, said he was unaware of AAP’s plans to move into the province. “I don’t know about this project,” he said.